From the 16th to the 24th of April 2016, the Murray–Darling Basin Authority celebrated Australian Heritage Week. Celebrating the Basin’s unique heritage adds to our sense of place, community and history and helps shape our identity as Australians. The Murray–Darling Basin is full of historic sites, informing us about the unique history of Australia and highlighting how Australia’s communities and environments transformed throughout time. The Willandra Lakes Region, including Mungo National Park, is an incredibly valuable heritage site located within the Basin. Its unique cultural and natural values are celebrated locally, nationally and internationally – it’s even listed on the United Nations Educational, Scientific and Cultural Organisation (UNESCO) World Heritage List. Over two million years old, the once full lakes are now dry and have developed into flat saline plains that host salt bush communities, fringed by sand dunes and woodlands. The exposed formation of the lakes shows how the harsh climate in inner southern New South Wales can shape a landscape over time. The once lush environment hosted a diverse range of plant and animal life, with gradual changes in climate and ecology over time preserving over 55 animal fossils, some of which were giant mammals. The fossil record also provides an insight into human uses of the area. Aboriginal groups have been moving through the Willandra Lakes region for at least 50,000 years. When the lakes were full, the Mungo people camped along the lake, taking advantage of the food and shelter found there. The discovery of the cremated remains of an Aboriginal woman, known as ‘Mungo Lady’, cemented the area’s status as an iconic heritage site. It is thought her remains are over 40,000 years old and, as she was cremated, it is believed her burial site is the oldest evidence of ritual cremation in the world. There has also been the discovery of around 460 fossilised footprints, belonging to both children and adults, which date back around 23,000 years. This is the largest collection of its kind in the world and has informed theories around how the site was once used. Now, the Willandra Lakes region is well known for its beautifully unique landscape and the diverse range of animals and plants that call the site home. This includes 22 species of mammals, 40 species of reptiles and amphibians and 137 species of birds. The Mungo National Park was established in 1979, in recognition of its combined Aboriginal, European and natural heritage. 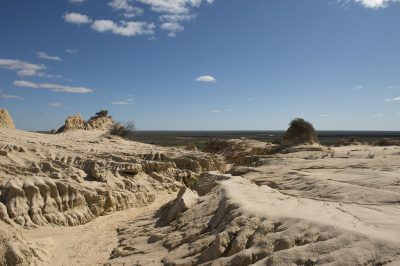 The ancient landscape of Lake Mungo in south-west New South Wales. Photo by Brayden Dykes, MDBA.